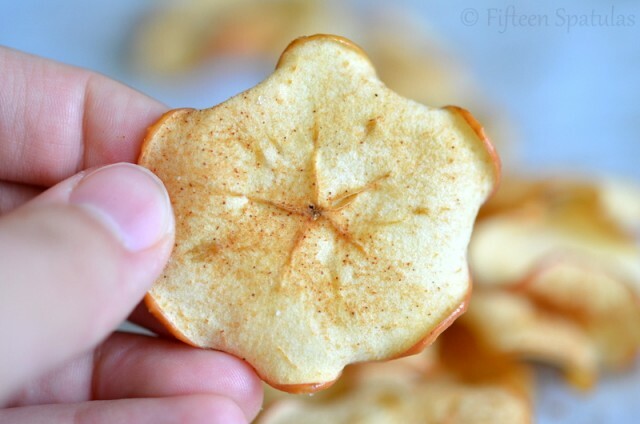 These Cinnamon Sugar Apple Chips aren’t fried, they’re baked! 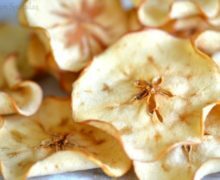 They’re a fun snack to make, and you can use your favorite variety of apple and different types of spices. Every time I turn the oven on to make a recipe, it doesn’t get turned off once that recipe is finished. Instead, I turn the oven down to 225, run to the fridge to grab an armful of apples, and go to town with the mandolin so I can stuff my face with what is soon going to be apple chips. Because ya know…the oven was already on anyway. I just love these so much and will take any excuse I can get to make them. Like many of the recipes I post on here, it’s a snack that may be traditionally prepared as deep fried, but I don’t do it that way. I like to bake things instead. In my eyes, there’s no reason to deep fry things that you can crisp in the oven. 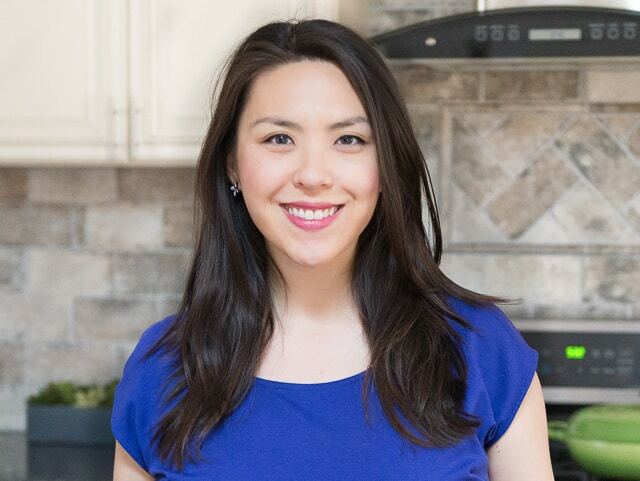 I’d rather save all those oil calories for a few bites of chocolate cake when I have an unexpected lady craving. It’s under $20 and works well. Is it a fancy $200 Japanese mandolin? No, but for $20 it does the trick. As you can see, the uncored apples are much prettier. But I’m sure you know already, that apple seeds are poisonous. You’d have to eat a lot of apple seeds to be in trouble, but whether or not you core or don’t core them, you do so at your own risk. 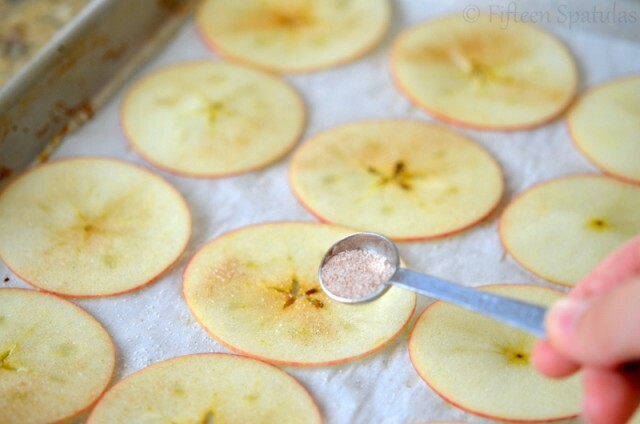 I like to sprinkle the apple slices with just a little bit of cinnamon sugar. I’m talking about a half teaspoon per 30-40 slices, which is 7 calories, no biggie! That tiny sprinkling of sugar really makes a difference. After they’re all prepped, they head into the oven to dehydrate and crisp up, and once they’ve cooled, they’re ready to eat! These Cinnamon Sugar Apple Chips aren't fried, they're baked! 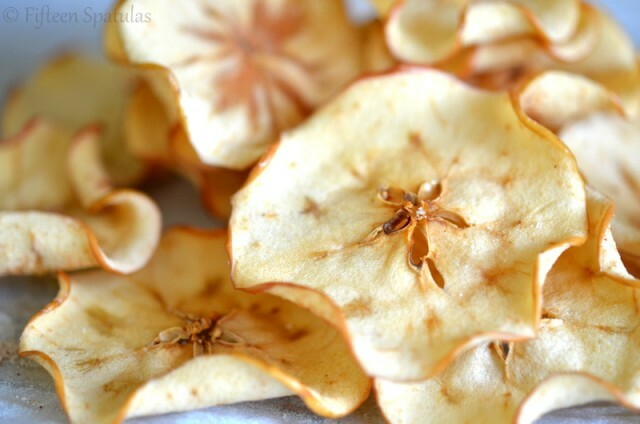 They're a fun snack to make, and you can use your favorite variety of apple and different types of spices. Stir together the cinnamon and sugar to combine. Set aside. 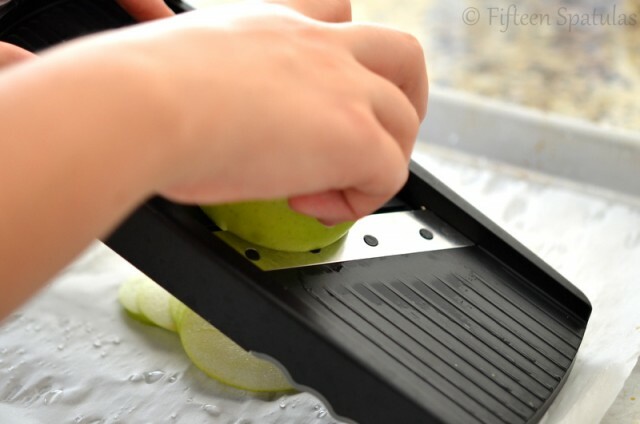 Decide whether or not to core your apples, then slice them thinly with a mandolin slicer. 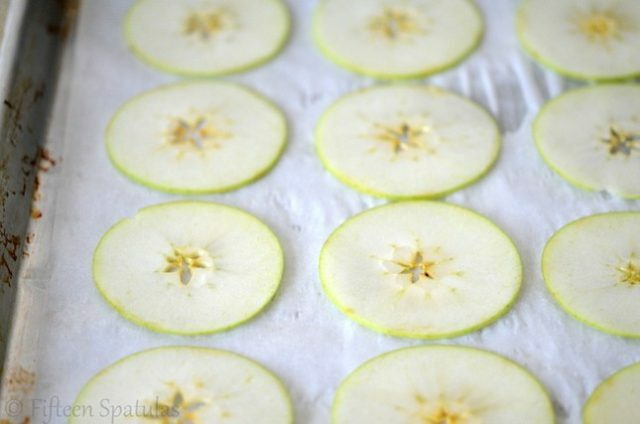 Line two sheet pans with parchment paper, and place the apple slices side by side on the parchment, in a single layer. Make sure not to overlap the apple slices or place them on top of each other, otherwise they won’t crisp up. Sprinkle the apple slices with the cinnamon sugar, and note that if you sprinkle from high above, the cinnamon sugar will disperse more evenly. 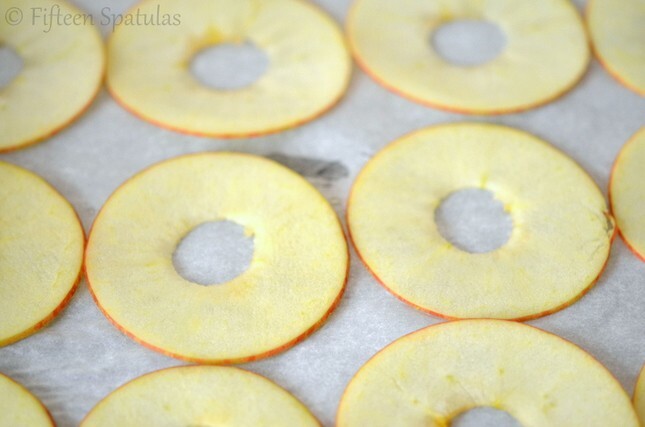 Bake the apple slices for 1 hour, then remove them from the oven and flip them over. The apples will be floppy, but they will crisp up later. Return the apple slices to the oven for another hour, then turn the oven off. Let the apple chips cool completely in the oven, this is when they will crisp up. Once they’ve cooled, enjoy! *I’ve only tried these with Golden Delicious and Fuji apples, my two favorites. 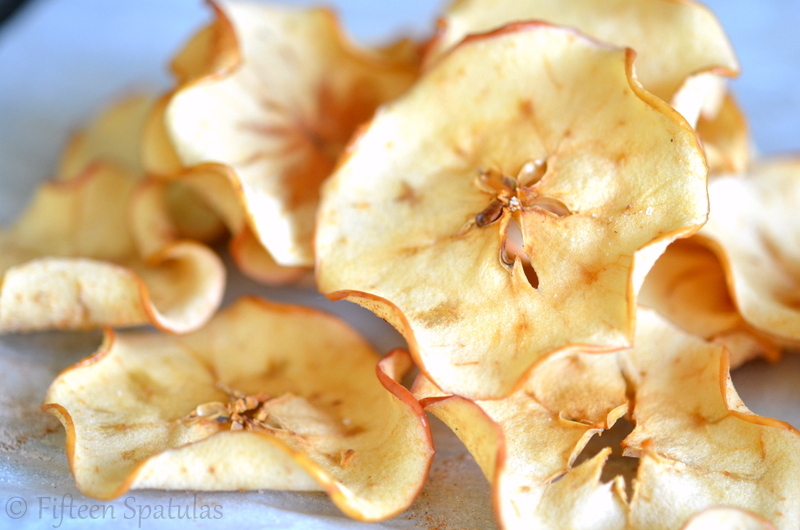 The Golden Delicious crisped much more than the Fujis did. I am going to test out additional apple varieties and will update this recipe each time I do. UPDATE: A reader has reported that Granny Smith works well too.